These are apart from Eggless Muffins & Quick Breads that get made. So, today we have the ever popular Onion Pakora (a.k.a Kanda Bhajiya or the Vengaaya Pakoda) but in an absolutely guilt free version. You don't need any reason to make this and eat it. Is it as tasty? yes, definitely. Is it healthy ? Absolutely. Halve the onions and finely slice them lengthwise. Add the salt and leave for 5 mins, then add the spices, salt, besan and rice flour. Rub the onions into the mixed flours and mix the spices thoroughly. Add half the oil and rub it into the mixture. On a baking tray, take small portions of this mixture and place them on the lined tray. Spray the rest of the oil and bake for 15-18 mins, tossing them midway, till crisp. Such a guilt free onion pakoras, if i make this i cant stop myself just with one. 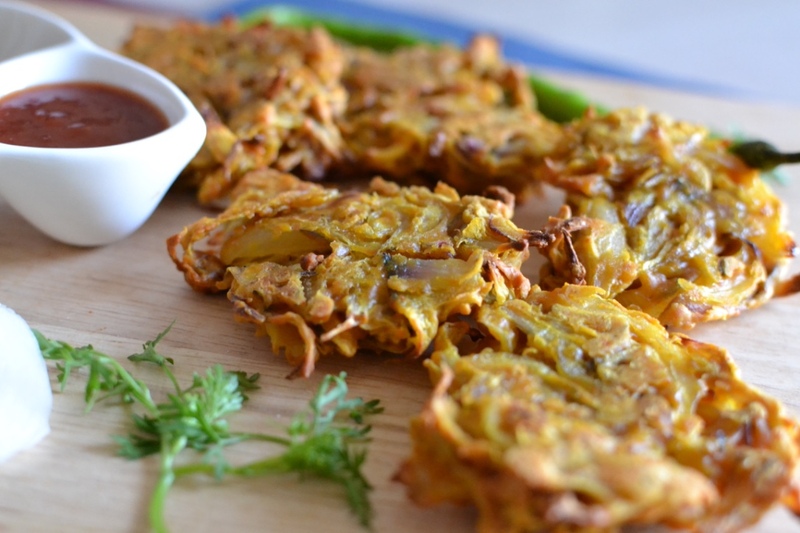 Thats a smart idea of baking onion pakoras Kalyani. Super like. Fantastic bake Kalyani, you have so many baked dishes of deep fried dishes..so healthy!..I am still trying to make these snacks in oven, must try..
Frying of course gives that taste and texture that we associate with pakoras, but with our sedentary lifestyle this tradeoff of Baking for frying is better for us. Addictive snack made in a healthy and guilt free way.Would give it a try soon. Perfect for me.. I am going to try this baked version soon.. Lovely share.. Baked version of pakoda is a dream come true. I could have them all the time! Amazing pick Kalyani! A wonderful way to enjoy pakodas without any guilt.Have to try it out soon. You are the queen of converting recipes to absolute healthy ones Kalyani. 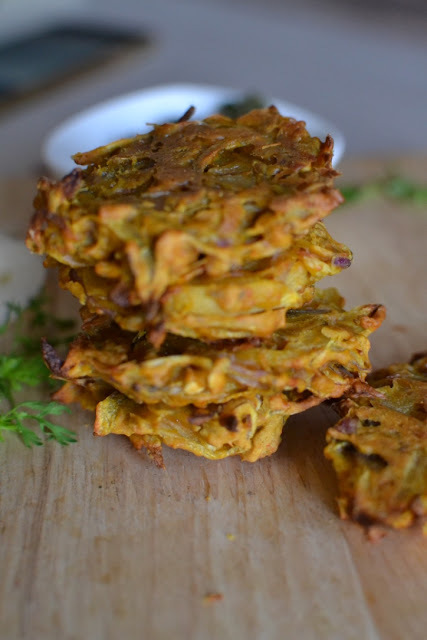 These onion pakodas look amazing, so much like the deep fried ones but amzingly healthy. This one I am going to try as soon as I can use besan. It's so tempting especially today as it is raining to try my hand at these pakoda. I always thought the fried pakora won't let date good if baked but seeing your posts I am pretty sure they tasted amazing. I am yet to try baked pakoras. These looks yum and perfect for those rainy afternoons. Awesome job baking it. 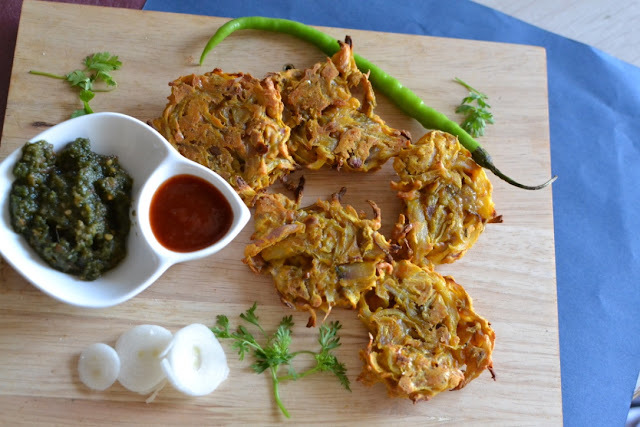 I never tried baked pakoras.. it looks tempting and crisp and good point is low calorie..